Trees can grow in places that regular cropping or animal raising may not be so practical, and give an amazingly rich return. A level 3 situation is a long-term scenario stretching beyond anything we could live through on the basis of stockpiled resources. We’ll run out of whatever energy we have stored, we’ll run out of whatever food we have stored, and we need to become self-sustaining. To be sure, we’ll enter a level 3 scenario with hopefully some advantages. We’ll have a year or more of time to live on our reserves, and to transition to an ongoing sustainable lifestyle for the future. We’ll have pre-existing shelter, and a range of both high-tech and low-tech equipment and productivity aids, and also a huge knowledge base of information to help us do the right things. Looking into the medium future, we have some obvious needs. The ability to maintain our shelter, and the availability of ongoing supplies of drinking water, food, and renewable energy being the biggest four challenges we’ll face. Ongoing access to Facebook is way down on the list! There’s a product that, in at least some parts of the US, is abundant, renewable, and very low maintenance in terms of growing and collecting it. This is a product that should be a central part of our planning. If the heading of this article hasn’t already given away the name of this product, allow us to now dramatically introduce to you – wood. Timber. Lumber. Logs. Call it whatever you like, but wood from trees promises to be an invaluable part of our lives in many respects. Although we can’t eat or drink wood, it can help us with maintaining our shelter, it can help us protect our lands and our crops and livestock, and it can act as a source of both heat (ie something as simple as an open fireplace) and energy (burn wood to fire boilers that drive steam-powered electricity generators). Think back to images of the pioneering days of the US, and the earlier history of many other countries. What do you see, wherever you look? Things made of wood. Indeed, even today, if you take all the wood out of your house and your life, you’ll have lots of huge gaps. Sure, the iron age, the steel age, and the industrial revolution are all improvements on the much more primitive wooden age, but without wood, none of the other enhancements would proceed. We said before that we will enter a level 3 scenario with some pre-existing ‘advantages’ – we use the quotes because, really, there’s nothing good about such a scenario at all, just hopefully some elements which are less bad than they could be. There’s another advantage that you can give yourself as well, something to keep massively in mind when choosing your retreat location. And that is having some trees on your land. What better way of storing energy and building materials than in the form of live, living trees; a resource that continues to grow with each passing year until needed and harvested. Of course, property that is treed will usually be more expensive than bare land, but you should be thinking not so much in terms of the present day net value of the trees (ie what you could get by selling the wood after meeting the costs of harvesting and probably reforestation) but instead, you should be thinking about the massively increased value to you these trees would represent in a level 3 situation. Just like a gallon of gas will soar in value ten-fold and more likely one hundred-fold in a level 2+ situation, so too will the value of trees rise. So the more treed land you can buy with your retreat, the more investment for the future you are getting at today’s bargain basement prices. If you can afford it, buy as much forested land as possible. There’s no real downside to this. Worst case scenario, you have people managing your trees for you, and you get a commercial ongoing return on the land anyway, and probably more so than if you’d left the money in the bank. Plus – unlike keeping your money in a bank – your trees are a tangible asset and form of wealth that will survive the onset of any level 2+ situation (assuming the situation isn’t initiated by a nearby atomic blast that flattens all your trees, of course – and even if that did happen, you still have the dead trees to convert to some timber and some firewood as best you can). If you already have a retreat that is without trees, we urge you to consider quickly starting a small tree plantation – perhaps giving yourself a several year head-start by planting saplings that have already been growing in a nursery for some years. For commercial purposes, it can take as much as 15 – 35 years for trees to mature to the point of it making good sense to harvest them (shorter time periods if you just want to burn the wood, longer time periods if you want to use the wood for construction); so if you can start your tree plantation with saplings that are already perhaps 5 years old, that is a head start for sure. Of course, in a survival situation, you might choose to start felling trees at the point that you have no choice and urgently need the wood, even if only to use them as firewood rather than as building materials. Here’s a very quick primer on some relevant issues to do with trees. If you are looking at some land that already has trees on it, you’ll of course want to know how much wood they comprise. This is a difficult thing to accurately establish. Clearly, it is impractical to have someone measuring each tree – not just its height, but its varying diameter and cross-section all the way up, plus adding in the mass in branches, too. Instead, there are a number of standard industry accepted ‘rules of thumb’ for using some easily determined parameters such as the tree’s circumference or diameter at a particular height above the ground (usually 4.5 ft) and its total height, and then assessing the probable amount of mass in the tree. These different rules of thumb can sometimes give very different answers. Some of the better known are the International ¼ inch, Doyle, and Scribner rules. Wood is also measured in different ways. If you just want to burn it, perhaps the most relevant measurement is by weight. If you are hoping to sell it for construction, then it is often measured in board feet – a board foot is one cubic foot of timber, usually thought of as a piece of wood one foot by one foot, and one inch thick. You’ll also see wood measured by the cord (particularly firewood). A cord of wood is a neatly tightly stacked pile of wood totaling 128 cu ft (typically in a form such as 4′ x 4′ x 8′). At least in theory, solid wood takes up about 80% – 85% of the volume of corded wood. A cord of red oak has the heating equivalent of about 108 gallons of fuel oil. You have a number of factors to consider in choosing the type of trees you’ll want to grow. All other things being equal, a tree that is predisposed to grow more quickly is preferable to one that is a slower growing tree. But there’s more to your decision than simply the theoretical rate of growth (ie accumulation of mass). One important issue is the ability of the tree to withstand the climate in your area, and also the presence of any bugs or other bio-hazards that will reduce the viability of your tree plantings. Water availability, aspect (ie if the land faces to the north or south), wind and of course soil quality and structure are all important issues. Then there is the issue of what purpose you wish to use the wood for. If you are growing wood to be used for construction purposes, you generally want to have a type of tree that grows long straight trunks. Sometimes you might want a hard wood – these typically are much slower growing trees. Some trees have wood that is more resilient to various types of decay once harvested and in use for construction materials or whatever than other types (for example cedar is more long-lasting outdoors than pine). But if you’re growing wood purely to burn, these matters become less important. There is also the matter of tree density. If you can have more trees closer together, you’ll obviously get a better return in terms of amount of wood per acre of land. This diversity of ‘best’ tree choice is shown, for example, with the range of species cultivated by Weyerhauser. In the western US, they primarily grow Douglas Fir and Cedar (122 million cu m as of 31 Dec, 2011), followed by 23 million cu m of Whitewood and 9 million cu m of other types of tree). But in the south they grow primarily Southern Yellow Pine (105 million cu m) and hardwood (30 million cu m). In Brazil and Uruguay, they have large holdings of Eucalyptus trees. Your choice depends on your environment and also on the purpose for which you want to use the trees. Energy source and construction materials will be your prime choices, whereas at present, trees for burning are very much a secondary use, and another primary use that will be less relevant to you is as a source of raw pulp for paper and cardboard products. We suggest you consult with local agricultural and horticultural specialists to see what types of trees would be best suited for your retreat area and follow their advice. This is one of those ‘how high is up’ type questions, because obviously even after one year you have a bit of growth, and after 100 years you may still be getting some growth. The optimum time to harvest recognizes that it takes a certain time until the trees are big enough to have sufficient commercial value to be felled and hauled away and then the land cleared and prepared for regrowth. When trees are young, they are too small to be useful as construction timber, and so they only have low value for firewood. As they get into their mid 20 years and above, they start to get commercially significant amounts of useful wood that can be used for construction purposes. It is also necessary to cut down some trees on a regular basis, whether you need to or not, so as to ‘thin’ out the trees, leaving the remaining ones with sufficient space for their leaf and root systems. You get more overall growth if you thin the trees as needed – and also get a trickle of wood out of your forest each year prior to the major harvest. 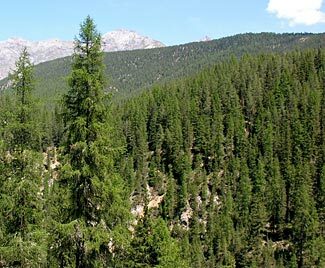 Generally, managed pine tree plantations are harvested after something like perhaps 25 – 40 years (in the south). Over a 35 year period, it is reasonable to expect anywhere from 67 tons to 151 tons of wood harvested (in the course of thinning operations and final harvesting) per acre, based on a planting rate of 700 trees/acre to start with. In such a model, there will be very little yield until thinning operations commence in about the 15th year. This article provides helpful information. It is also possible to delay/defer the time of main tree harvesting. Clearly you wouldn’t want to have a forest that gives you a supply of timber once every 35 years, and almost nothing in-between times. To get a new forest development started, you can start felling some areas a bit earlier than optimum, and other areas a bit later than optimum, so as to spread the main harvest time over a decade. Then if you repeat this for successive generations, in time you’ll end up with steady logging operations each year. Hardwood trees can take twice as long to reach a harvesting point (ie 60 – 80 years or more). This makes them impractical for most of our purposes. The rate at which trees grow depends on many things. Climate and soil are two very important variables; unfortunately, once we’ve chosen a retreat location, we no longer have much additional input on the climate issue, and soil type and chemistry may or may not be something that it is easy/practical for us to adjust substantially. However we obviously can make the best choice possible when it comes to choosing tree type, and trying to match the best tree type to the local prevailing situations. This webpage lists various types of trees that were grown at the Morton Arboretum near Chicago. They started off as 10 ft tall saplings, and then after ten years, were categorized as fast growing (trees now 25′ tall or taller – ie, they had grown an extra 15 ft), moderate (18 – 25 ft) or slow (less than 18 ft). We can’t make too many specific statements from this one set of results, but clearly, even if all other things aren’t completely equal, an American Elm is more likely to grow faster than a Yellowwood. Here’s another list of trees graded as fastest, faster, and fast growing, taken from this page. If your retreat is located in a part of the country that is amendable to forestry, you would be very well advised to allocate some of its land to tree growing. Better still is to buy a retreat property that already has existing stands of trees on it, so you don’t need to work through the lengthy lead times to the point where you can start harvesting the trees in appreciable quantities. The amount of yield you get from trees varies enormously, but a reasonable range is from 67 – 151 tons per acre per year (when averaged out over a 35 year cycle, and with trees initially planted at a density of 700 trees/acre). This translates to, extremely approximately, somewhere between the heating energy equivalent of 4,500 – 10,000 gallons of heating oil per acre of forest per year. Or to somewhere between 40 MWhr and 100 MWhr of electricity. To put that in daily terms which might be more meaningful, we’re talking 12 – 27 gallons of heating oil equivalent a day, or about 100 kWhr – 250 kWhr of electricity. Clearly, even a small stand of only several acres of trees, if optimally planted and managed, can be sufficient to give you true energy independence, as well as material for the construction of everything from furniture to houses, barns and wagons, and also a possibly valuable trading good when buying/selling things with other people. Is this a summer picture in Arizona? Or a winter picture in New England? A nuclear winter could make the latter into the former. One of the risks you probably consider is that of our country being attacked by nuclear weapons. In scientific terms, that would be termed ‘a helluva bad thing’ and we of course hope it never happens. But if it does, we also hope that we’re not at any of the ground zeros, and that our preparations will enable us to survive through the difficult times that would inevitably follow. But what say two other countries get in a nuclear shouting match? Without wishing to ascribe exact risk levels, it is probably more likely that, say, India and Pakistan, or Israel and Iran might start lobbing nuclear weapons at each other, than we and the Russians will duke it out. Other than for humanitarian reasons, do we – should we – care at all if two other countries, both far from us, engage in a nuclear exchange? While in theory a couple of nuclear explosions, half-way round the world, plus or minus, will be no more harmful to us than have been the hundreds we’ve set off ourselves, mainly in Nevada, but also in Alaska, Colorado, Mississippi and New Mexico as well as around the Pacific, there are issues associated with an actual nuclear war, wherever it occurs, that should give us concern. Our hundreds of tests took place over an extended period of over 45 years from 1945, and in the latter half were underground. Most were of moderate strength only, in deserted areas, and seldom was there more than one or two a month. Compare this with what would happen in a nuclear war between two secondary powers. Although they don’t have the thousands or tens of thousands of nuclear weapons that Russia and the US each has, India, Pakistan and Israel all are thought to have more than 100 devices a piece. It is not known how many North Korea has (probably less than 10) and probably there are not yet other nuclear powers in the Middle East (although every day brings Iran closer to having nuclear weapons). It is reasonable to fear that a nuclear war would see the aggressor power send anywhere from 10 to 50 nuclear missiles at the country it was attacking, and it is probable that the attacked country would reciprocate with most of the nuclear weapons it was able to deploy in return. In other words, within the space of an hour or two, there could be 100 or more nuclear explosions. Furthermore, it is likely that at least some of the targets will be cities and other areas of concentrated industrial development, meaning that the initial nuclear blasts will be followed up by major secondary effects – massive firestorms as the targeted cities and factories burn. The side-effect of all of this is thought to be the nuclear winter concept that was first discussed in the mid/late 1980s. 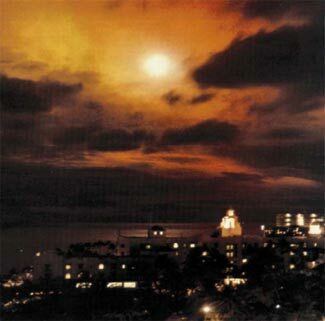 The smoke from the nuclear bombing and subsequent firestorms would darken the upper atmosphere, reflecting away and/or blocking the sun’s rays, causing the surface of the planet to cool. This effect could last for more than a year, destroying crops, changing weather patterns, and generally destroying our entire food system. See the discussion on this page from the Scientific American site, for example. 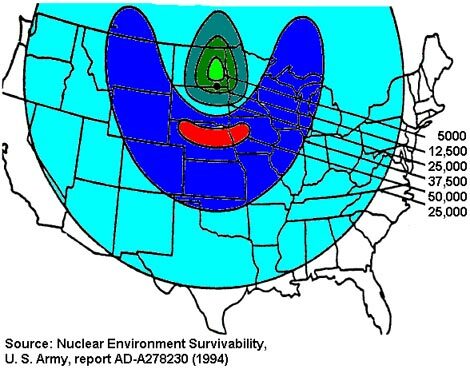 The good news is that the nuclear winter scenario is not without its critics and is far from guaranteed. The major conventional bombings and firestorms that occurred late in World War 2 did not seem to have significant impacts on the global climate. But if a nuclear winter effect does happen, either totally or in some reduced but still measurable amount, we have to consider the consequences, which are likely to impact on the entire planet. There are several implications for us as preppers. The first is to be aware that the solar power that probably figures prominently in our planning as an energy source in a Level 2/3 scenario would not be as effective as we hope. If we lose 50% of the sun’s power, we lose – yes – 50% of the energy the solar cells would otherwise generate. As for wind turbines, and at the risk of making an over-generalization, we’ll guess that if there is less energy from the sun reaching the earth, there will be less wind. Wind and pretty much all other weather is a byproduct of the sun’s energy and if there is less energy from the sun, there’ll be less strong weather, too. Wind turbine power production could fall even more dramatically than solar power generation, because wind turbines require a minimum amount of wind before they even start to generate any electricity at all, whereas solar cells will still at least generate a reduced level of power in low light conditions. The second implication is that our plans to immediately start raising crops and animals if LAWKI ends may need to have a fallback contingency. If the earth’s overall temperature falls, there could be one or more than one growing season completely lost before things recover back to something sufficiently close to normal again. So, it would be prudent to lay in another few thousand gallons of propane or diesel as an energy source and a few more buckets of dried food concentrate. Potatoes, fresh from the ground, prior to being cured then stored. Potatoes are an excellent crop to grow, and to store. Probably no other crop yields as much protein, or as many calories, when measured against the hours of work it takes you to grow, care for and harvest them. Potatoes yield more calories per square foot of growing space than anything else, and more protein than anything except for legumes. Depending on the soil and your growing strategy, you can expect yields from about 1.25 lbs per linear foot of potato row up to 4 lbs or more per linear foot (ie between about 20,000 and 70,000 lbs/acre – national commercial average of 41,300 lbs/acre). Originating in South America, potatoes were brought to Europe in the late 1500s. They have steadily grown in popularity and now are the world’s third largest cash crop (after rice and wheat). Potatoes don’t need a lot of water or fertilizer. And if stored in optimum conditions, you can get as much as ten months of storage once you’ve harvested them. They can be grown across much of the US, and although they prefer cooler climates, they are even grown in Florida and Arizona. They are grown commercially in 36 of the 48 Conus states. Potatoes are also a key source of nutrition for most of us. On average, Americans each ate 117 lbs of potato in 2010. That’s not to say that potatoes are a perfect crop. Of course, some environments are not suited for potato growing (and different types of potatoes grow better/worse in different conditions), and equally of course, as students of history will know (the various Irish and Scottish potato famines in the 1840s and 1850s) they are vulnerable to some types of bio-hazards (particularly viruses and pests) that can destroy entire growing seasons worth of potatoes. As with anything else, we always encourage you to diversify the food products you grow so if one crop has problems, you will hopefully still have other crops unaffected by the problems impacting on the challenged crops. But those considerations are for another time. Tis article starts at the end of the growing of potatoes, and assumes you have already carefully harvested them at the ideal time. There are four considerations to keep in mind when storing potatoes. They need to be kept cold, dark, humid, and with a small amount of air circulation. Remember that the harvested potatoes remain as living things. They are made up of about 80% water and so need to be in a humid environment to prevent them drying out. The cooler they are kept, the slower their ongoing aging will be, and keeping them out of the light will prevent the light stimulating the formation of bitter-tasting and poisonous glycoalkaloids. Let’s look at their storage requirements step by step. You should avoid washing the potatoes (ie keep them dry) unless absolutely essential. If you must wash them, do so gently and not physically damage the potatoes (they are reasonably vulnerable to damage until their outer skin has a chance to harden) and ensure they are well dried. 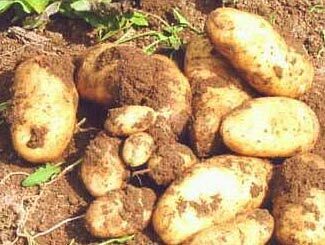 It is recommended you should dig up the potatoes after a few days of dry weather, so they will be dry to start with, and leave the potatoes out in the field for a couple of hours so as to dry them further and to make it easier to clean them by brushing any dirt off them. Treat potatoes as reasonably fragile before they have been cured (and still treat them carefully afterwards too). Before putting the potatoes into ‘deep sleep’ you first want to encourage them to adjust to their now out-of-the-ground experience. You do this by curing them for a week or two, in a well ventilated humid and dark place, at a temperature of about 50 – 60 degrees, or a shorter time at a warmer temperature (ie 5 – 10 days at 59 – 68 F). This will toughen up their skins and might help any harvesting damage to heal. Humidity should be about 95% – 98% – as humid as possible without condensation forming. At the end of the curing process, you will want to inspect all the potatoes again, and if they are satisfactory with no sign of any type of infection or damage, transfer them to long-term storage. This will also be in the dark, and also be very humid – as before, as humid as possible without allowing any condensation. Actual water will cause the potatoes to rot. Temperature is ideally cool to cold, but no colder than about 39 F. If you plan on frying the potatoes, you might want to keep them a bit warmer – perhaps no cooler than 45 F. Colder temperatures accelerate the speed of starches converting to sugars, and while in some vegetables, a sweetness is desirable, it tastes strange in potatoes. Furthermore, if you then fry the potato, the sugars would burn. Warmer temperatures encourage the potatoes to sprout and also accelerate the development of tuber diseases. There should be a little air flow to enable the potatoes to ‘breathe’. Be careful what else might be stored in the same area, or sharing the same air. Some produce gives off ethylene gas which massively reduces the storage life of potatoes. And the subtle smell given off by stored potatoes can be taken up by apples and gives them an unpleasant flavor. Don’t store the potatoes piled too high – not only does this reduce the air flow into the potatoes in the middle of the store, but it also puts harmful pressure on the lower potatoes that might damage them. It is suggested not to have potatoes piled more than 2 feet high. From time to time during their storage (ie about once a month – more regularly if you are having storage problems) you should inspect them for signs of any rot or infection. Remove any that show any signs of problems, before they start to infect other potatoes close to them. Some people suggest removing adjacent potatoes if you find a potato that is going bad. In a perfect world, this makes sense, but you need to trade-off between, on the one hand, disposing of too many potatoes unnecessarily just because of their proximity to bad potatoes, and on the other hand, of not throwing away infected potatoes that quickly get worse and pass the infection further on into your potato stock. Probably what we’d do is create two supplementary storage places in your potato cellar. One for actively going bad potatoes, and we’d eat those first (well, not the bad bits, of course). Then the second storage place would be for suspect potatoes, and we’d eat those second, leaving the main bulk of the potatoes in the normal storage area(s). Store seed potatoes at a colder temperature than ones you plan to subsequently eat. You can take seed potatoes all the way down to almost freezing. You also want to keep the humidity high for them, too, but with seed potatoes a pale diffuse ambient light is recommended. When potatoes are exposed to the light, two things happen. A green layer forms on the exterior of the potatoes, and glycoalkaloids are formed inside the potato. Glycoalkaloids (in particular, solanine) are both bitter and poisonous. All potatoes have a low level of glycoalkaloid in them, and they help to give potatoes their distinctive flavor/taste. Light exposure causes more glycoalkaloids to form. Some people think the green they see contains the glycoalkaloids. This is not so – the green is harmless chlorophyll. And so simply peeling off the green layer does not make the potato safe to eat. The green chlorophyll is merely an indicator that correlates to the level/presence of glycoalkaloid in the potato as well. If you see a lot of green, dispose of the potato and don’t eat it. Even a day of sunlight can be enough to push glycoalkaloids up to unacceptable levels (something to think about next time you visit a farmers’ market in the summer and see stalls with displays of potatoes sitting in the sunlight). Not everyone will have a perfect potato store-room. The key things for you to consider when storing potatoes are keeping the temperature as cool as possible, but generally above about 40 degrees, and to ensure there is no light in the storage area. The next thing to optimize would be the humidity – the more the merrier – and a little bit of air flow. Also, remember to check the potatoes when first storing them. If they are your own potatoes, clean and cure them first, be sure they are dry, and remove any ones with any signs of infection. A day of bright sunlight is enough to spoil a potato, so darkness is most important. As for temperature and humidity, the warmer the temperature, the quicker the potatoes will age, and the drier, the more the potatoes will shrivel up. Sprouting is usually the first sign of potatoes being stored too warm, and shriveling a sign of insufficient humidity. You’ll see a number of internet sites with various suggestions about how to store potatoes if you don’t have a temperature and humidity controlled cellar. Some of these sites have conflicting and even close to contradictory ideas; the kindest reason we can think of for this is that they are recognizing the compromises that have to be made and are more concerned with extending potato life from a week or two (if not stored well) up to a month or two (in slightly better conditions). Boxes lined with straw or peat moss are a common theme. If you do this, remember the need for potatoes to breathe and to get some fresh air, and also remember that while it is okay to keep the potatoes humid, you don’t want to get them actually damp/wet. If nothing else, keep them in the coldest part of your house, and block the light from reaching them. Some root vegetables allow for very simple storage – simply leaving them in the ground. This is less appropriate for potatoes. The humble spud should be an integral part of your food growing and storage plans. It has everything going for it – reasonably easy to grow, gives a good food yield in terms of the amount of man hours needed to put in to growing them, is nutritious, and can be stored for up to 10 months. The closer to our optimum storage guidelines you can get, the longer the storage life and the better the potatoes will be when you eat them. 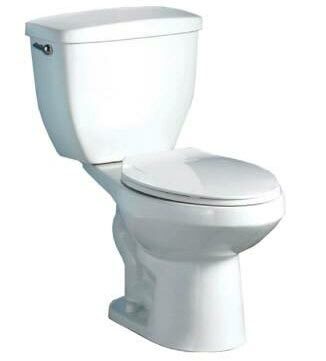 The reliable functioning of our toilets is something we shouldn't take for granted. So something has gone wrong in part or all of your city or region, but you’re reasonably confident it will be resolved some time in the next few days; a week or two at the most. In other words, you don’t need to bug-out and move to your retreat location, so this is by definition a Level 1 situation. However, while you’re not forced to bug-out, you do want to enjoy as comfortable an experience as possible while waiting out the Level 1 event. You’ve planned and prepped for many of the things that might go wrong. You’ve stocked up with some food, some water, maybe a generator and gas to power it, perhaps a few propane tanks for emergency cooking on the barbecue, and who knows what else. But we’ll wager there is still one massive thing you’ve completely forgotten. We’ll give you a hint. So you’re anticipating a possible situation where you’ll not be able to get fresh water from your taps – where the city water supply will fail, right? Okay, good for you. Now, if the city water supply has failed, what else might fail, too? And every time you eat something or drink something, what will inevitably need to be done some time subsequently? Did you guess? We’re talking about the sewer system. If something occurs to cause a failure of the city water supply, it is very likely there’ll be a failure of the city sewer system, too. How are you prepared to handle a failure of your sewer system? Remember that all the water you use that goes into a sink or drain ends up going out the sewer line. We automatically think of toilets, but it isn’t just toilets. With a blocked sewer line, you’ll not be able to shower or bathe, you’ll not be able to empty the sink, or to conveniently do anything that involves waste water. The biggest issue of course is the toilet. Other things can have relatively easy workarounds, but the toilet is hard to recreate to a similar level of comfort and convenience. What will you do? Porta-potties? 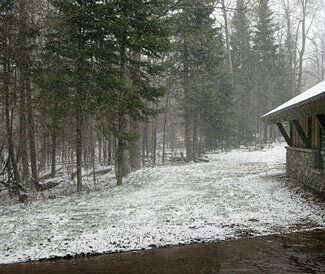 Dig an outhouse and erect a privacy/weather shelter around it? Or? Call us spoiled if you like, but we do believe the modern flush toilet to be one of the finest elements of our modern life, and we’d be very reluctant to lose it. Happily, we don’t need to risk sacrificing the wonders of the porcelain pedestal. More about that in a minute (or two, depending on how fast you’re reading this!). First, let’s consider some more about this failure. The first part is comparatively benign. If the pipes break and become blocked, and/or if the pumping stations stop pumping, then clearly there will come a point, when you flush your toilet, nothing will go away. That’s actually the relatively good news, believe it or not. There’s some bad news too. The bad news depends on where you’re located and the style of house you have. If you have a one level rambler and your house is at the highest point for miles around, you can stop reading this part and skip down to the next part. But if you have a multi-level house, and/or if there are other houses around you at the same or higher levels, guess what could happen. Your upstairs toilets will appear to work, inasmuch as when you flush them, the bowl empties and the contents go away. The liquid (and, ahem, solids) will be released into your sewer feed pipe, and then will go downhill as far as it can before stopping. That downhill path would normally take it out of your house, and if the sewer system has now filled all the way up to your house, the results of your flushing won’t just stop and wait patiently for the blockage to clear or the pumps to restart. Instead, it will ‘find its own level’ and so will start to come out of the bowl of your lowest level toilet (we’ve seen this happen – it isn’t pretty). But that’s only a small part of the problem. What happens when your neighbor, on a grade 10 ft above your house, flushes his toilet? As far as he can tell, it will still work for him. None of his toilets will turn into fountains. What came from your neighbor’s toilet will also end up coming out of the lowest toilet in your house (or possibly out of the toilet in someone else’s house lower down). It is possible to get one-way valves to put into your sewer lines so that waste will flow in one direction only – ie, away from your house. This doesn’t solve the problem of the higher toilets in your house, but that’s something you can control yourself, hopefully. It should, however, isolate you from what your neighbors are doing. We’re not sure we fully trust these one-way valves. They could get clogged up with ‘stuff’, and because, for 99.9% of their life, they’ll be open and allowing waste to flow in the proper direction, the one time they’re called upon to actually do their thing and stop a backflow, they might not work, or, at best, they might stop some of the backflow but still let a small flow through. There’s also a low tech solution. When your toilets start turning into fountains, you can stuff clothing and other things down them to block them. And you’ll also want to block your baths. And your sinks. And everything else. Not very nice. There’s a much better solution. Many people aspire to live off the electricity grid, and some people even manage to do this, to a greater or lesser extent, and with a greater or lesser amount of privation and inconvenience. But how many people think about living off the ‘sewer grid’ – especially at their primary residence? Almost next to no-one. While, in truth, there is not much likelihood of your city sewer system failing, it can happen and has happened, particularly as a result of an earthquake (think not just primitive third world cities, but also places as modern and western as, eg, Christchurch NZ in 2010 and 2011. As well as natural causes, a total failure of the electricity grid (perhaps caused by solar storm or EMP or cyber-hack-attack) would also kill the pumps and control systems and result in a non-functional sewer system. You need to consider what you’d do if your sewer line failed – if you have a retreat and if it would be convenient to simply move to your retreat until the sewer system was repaired, that would probably be all the planning you need to do for this eventuality (apart from also having some way to block the sewer line from your house to the street so you don’t end up with any backflows in your absence. But if you don’t have a retreat, or if moving to your retreat would not be convenient in all but the most extreme of Level 2/3 situations, then you need to consider how you’d handle a loss of sewer service. Why not add a septic system to your current home? This is something you could do in one of two forms, and with perhaps some bonus everyday benefits too. You could simply put a large holding tank in the ground, and have a valve to divert the flow of effluent out of your house, causing it to redirect to the holding tank rather than flowing into the city sewer line. This valve would also protect you from backflows from other houses around you. If you cut back on water use in your home, you could readily get down to 50 or fewer gallons of water used per person per day (and of course the same amount flowing into the holding tank). If there are four of you, maybe this would be 150 gallons a day, and so with a 1,000 gallon tank you’d have close on 7 days at nearly normal rates of water use, and if you really cut back on water use, you could probably get more like two weeks from a 1,000 gallon tank (ie more than 50 ‘person/days’). If you still have no sewer service after two weeks, and it is a Level 1 situation, there would be septic tank pump out service providers still operating, and you’d simply schedule a pump-out once every ten days or so during the period of the outage. They’ll probably be busier than normal, so we’d recommend scheduling a service a week in advance after only a few days of using the holding tank, and booking scheduled future servicings well in advance too. This would be a relatively low-cost enhancement to your primary residence – we’ll guess between $1000 and $2000 depending on how easy it is to get a tank into your back yard and the plumbing lines run to it. The other approach is to put in a full working septic system complete with drainfield. This would give you a system that would work for years at a time between pumpouts, and would mean you could cut your connection to the city sewer service entirely. In some jurisdictions, you might even be able to save money by no longer paying a monthly/bi-monthly/quarterly sewer fee to the city. We provide a quick overview of septic tank systems here, and depending on the type of system you had installed, you could be spending as little as $5,000 for a complete system that totally takes you off the septic grid. If you can get a rebate on city sewer fees, you might be surprised at the ability of your off-grid septic system to pay for itself. City sewer systems, while very convenient, are also very expensive to operate, so depending on how fairly the costs are being passed back to the users, you might find your own private septic system to not only be more reliable but also less expensive. While everyone we know keeps a reserve supply of water in their normal residence, very few people have thought further as to how to maintain some type of sewer service for their household’s grey water (ie from washing up and such activities) and black water (ie from toilets). We’d prefer to suffer a power outage than a sewer outage. Fortunately, it doesn’t take too ridiculous an amount of prepping to prepare for a sewer system failure and to have a standby system every bit as good as the main system. 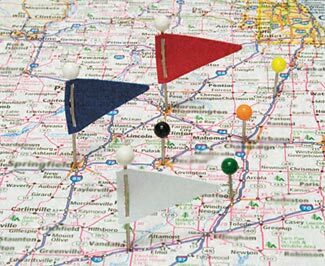 Choosing a retreat location involves lots of variables. So you’ve decided to take your prepping to the next level. 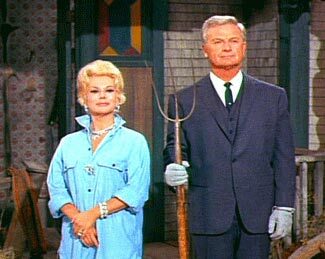 You’re graduating from merely having lots of dried food in the basement to deciding to now invest in a retreat; somewhere you’ll relocate to if/when society crashes and crumbles. Now let’s guess what it is you’re doing. Our crystal ball suggests you’re doing two things. You’re looking at a map, with your current residence more or less centered, and you’re trying to work out how far is far enough away from the city you normally live in, and also how far becomes too far away. Are we right? And you’re also working through your financial position, working out what you can afford to put down on a retreat, and how much a month you can afford to make in payments. Are we right again? Now – your turn to guess. Can you guess the huge assumption that you’re making? You are assuming that your ‘normal’ life will continue unchanged – indeed, you’re desperately hoping that will be the case. And in doing so, you’ve massively reduced your options in two important areas. First, you’ve all of a sudden made most of the country out of reach and impractical to consider as a retreat location. You’ll probably agree that, best case scenario, you can’t plan to travel more than 500 miles from where you normally live to a retreat, and ideally, you’d not want to go even half that distance. You probably want to be at least 50 miles from your city, and 50 miles from any other major city (ie with a population of 100,000+), so when you first draw a radius of maximum distance away from your present location, then start taking out big holes in the middle of this around other cities that might come within the maximum distance radius, all of a sudden you’ll see there’s not a whole lot of much left. Second, although you’re hopefully doing reasonably well, financially, and are able to support your current household and living costs, you’re probably looking a bit anxiously at the new idea of now having to double up on all these costs. Why not think outside the box. We have two suggestions for you – a relatively easy one and a harder one. Our first suggestion is the relatively easy one. Instead of continuing to own your present home as you do, why not sell it, and rent a smaller less expensive apartment (or buy a smaller condo)? Indeed, as part of this transition, you can also choose a more optimized location within your current city region that will be best positioned for bugging out from – it can be on the same side of town as the direction of travel towards your retreat; and far enough from the center of the city as to have a head start on things if problems start to develop. It can also be away from local danger areas and ‘hot spots’. If you do this, you’ve reduced your monthly outgoings for your main residence, and maybe you’ve taken some cash out of the property too, either by downgrading or converting from owning to renting. This puts you in a much better financial position to have a greater downpayment for your retreat, and better able to afford the ongoing monthly costs of ownership for your retreat too. Even if you swap from owning to renting a property for what was formerly your primary residence, you’re not losing out, because you’ll now have a property you own at your retreat location. So you are still participating in the property market, just at a different location. There’s no financial penalty associated. We of course don’t know how long you’ve lived at your present primary residence, but maybe things have changed since you moved there. Maybe the neighborhood (and/or neighbors) have changed, maybe you’re now empty nesters, maybe many different things have changed. Why not use this as an opportunity to update your primary residential lifestyle. Choosing a nice place for your retreat will also mean that it is a place you actively like visiting. This means you’ll be more likely to evacuate sooner if things start to go wrong – there’ll be less perceived ‘pain’ in making a transition and more willingness/eagerness to go there. It also means you can get value from your retreat as a place to stay at over long weekends, for some of the summer, and so on. The more time you spend at your retreat, the more opportunities you have to test everything out there, and find out what works and what doesn’t work, what else would be useful, and so on. Plus, the more you’re there, the more you can become part of whatever local community there is in the area, too. Now for the big one – but really, for most of us, it is only big because we seldom face such things head on, and usually when we do, it is not in a time and situation of our own choosing. This time, however, it is on your terms. We are suggesting you start off with a blank sheet of paper, and choose the best location in the entire US for your retreat. Then, and only then, choose possible locations to live in and work in that are reasonably close to your retreat. Ideally, you might be able to accept a career change – although that might involve a downgrading of income – and work somewhere close to your retreat, and make your retreat your main and only dwelling. An ideal type of retreat job would be as a farmer/market gardener/orchardist. Or alternatively, perhaps you set up a general store in the nearest town. In good times, it will be a regular general store, and in hard times, it will be your survival warehouse, full of what you (and others in your community) need to survive. If this is not practical, you might be making a poor choice of location for your retreat. While you don’t want to have too many people too close to you, we urge you to become at least an outlying part of some small community, so you have people to turn to for occasional assistance, and people to trade with. And you want your land-holdings to be capable of supporting and sustaining some sort of agricultural production, whether it be livestock or cropping or whatever. One very important thing. Don’t quit your present job until you’ve lined up a new job. People who are currently employed are viewed as being much more desirable by potential future employers than are people who are unemployed. If you’re asked why you are making the move, there’s no need to give a long lecture about society’s vulnerabilities, etc. Simply say that it is a lifestyle choice, and you want to move somewhere you feel more comfortable in and where you can better merge together work and home environments, to be more productive at work and happier at home. Most people who live anywhere feel it to be a good place to live, and so this type of answer won’t need any further explanation, and will be positively received by the person interviewing them – it affirms their own choice to live there, too. Choosing your retreat is one of the biggest decisions you’ll make in your life, and may have the greatest impact of any decision on your future. Now is not the time to start making huge compromises that will reduce the effectiveness of your retreat choice. The reality is that many parts of the country have nowhere appropriate as a retreat within a convenient traveling distance; so why not consider moving your primary residence as part of selecting a retreat location. About 20% of the US population move every year. You’ve probably moved in the past. There’s no reason why you couldn’t again, and lots of reasons why you should. The next attack on the US may be via cyber-warfare rather than traditional means. Here is an interesting two page article on the CNBC website. It is interesting and also has some irony in it. The irony is that one of the best known ‘virus hunter’ companies out there, Kaspersky Labs in Moscow, is rumored to be associated with the Russian intelligence services. Are they really friend or foe – good guys or bad guys? And even if not controlled by or working in cooperation with Russia’s security services, note also the comment about its passive non-activities when confronting Russian originated cybercrime – and the huge $12 billion a year value of cybercrime at present. Kaspersky’s call for an international treaty banning cyber-warfare seems naive and would disadvantage us if passed. Cyber-warfare is, by definition, discreet and obfuscated; and if successful one never really knows what happened, how, or why, and – most to the point – one never knows which nation originated the attack. An international treaty against cyber-warfare would only constrain ‘honest’ countries – the countries we have the least to fear from, while doing nothing at all to discourage dishonest countries from pressing forward with their cyber-warfare plans. Unlike the complex industrial processes needed to research and built a nuclear weapon, cyber-warfare research leaves no clues of its presence. All the attackers need are a few computers. However, when Kaspersky points out that a cyber-attack could disrupt power grids and financial systems, and wreak havoc with military defenses, he is echoing our concerns, and when he says cyber weapons are the most dangerous innovation of this century, he is exactly correct. He goes on to explain that a growing array of countries and shadowy other entities (terrorist organizations, organized crime groups, etc) are using ‘online weapons’ because they are thousands of times cheaper than conventional armaments. He doesn’t say, but could, that cyber attacks are also thousands of times safer for the attacker. The main reason for our several mentions of cyber-threats recently is simply to point out another area where society is vulnerable to a massive failure that could mean the end of Life as we know it (LAWKI). As Kaspersky points out, a computer virus could disrupt/destroy our power grid or our financial system, and that’s just the start of a long list of vulnerabilities. As we’ve said before, we challenge you to mention any essential part of our life today that doesn’t rely on computerization. The bottom line is clear (at least to us as preppers). Many people, with both eyes tightly shut, like to think of modern society as invulnerable, or at the least, as ‘fault tolerant’ and resilient. If something fails in our modern society, these people like to think that it would only require a few minor adjustments to return life pretty much back to ‘normal’. We disagree. Modern society is not fault tolerant. It has a growing series of interlocking dependencies, and with ‘just in time inventories’ and with much less underlying industrial capacity and longer lead times to retool up and create productive capacity to manufacture just about anything and everything, it only requires the failure of one seemingly small part of the total structure of our society to result in the entire edifice crumbling and crashing to the ground. Many of these vulnerabilities are subtle and are things that we’ve never even stopped to think about – for example, the fire in a single small factory in Germany that now threatens the global automobile industry. While that is hardly a society-destroying failure, it indicates how small things have unexpected and much larger consequences, and who knows what the next failure or consequence might be. We can’t prevent such failures from unexpectedly occurring, and neither can we predict what they are and when they might happen and what the outcomes might be. All we can do is prepare for the consequences. One more thing. It is wise to maintain a general distrust of all computerized equipment. 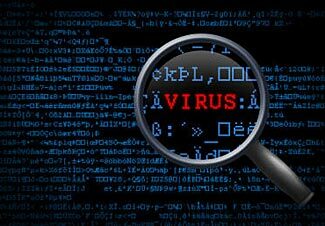 Computer viruses don’t just attack what we think of as computers – devices with a screen and keyboard which we can browse the internet on. They also attack computer controllers – the internal control circuits that are becoming an essential part of almost everything, from automobiles to elevators, from home automation systems to industrial machines, from credit/debit card readers in a store or gas station to stop lights and other traffic management systems, from airplanes to telecommunications, and for sure, the network hubs and routers that are the glue that binds the internet together. All of these computer controllers can be infected with viruses to disrupt how they control the device they are installed inside, and with many times a very wide range of different devices all using the same internal controllers, the potential for widespread havoc and disruption is magnified. For example, at your retreat, you may have some electricity generating equipment – maybe a generator, maybe solar panels, maybe even a wind turbine. And you probably have a bank of batteries to store electricity. Which means you also have some sort of charging and battery management control system, which almost certainly is managed by a computerized controller. What happens if the computerized controller starts misbehaving? It is probably impossible to build an effective efficient retreat without using some computerized controllers, and the risk is that for all you know, the computerized controller has within it a hidden line of code that says ‘On Dec 21, 2012, stop working’ (a terrorist with a sense of humor!). Of course this is just one example of how a virus could be activated, there are many other ‘trigger’ events that could apply too. All we are saying is that after you’ve built your first layer of preparations, start to think about ‘what if’ events that could impact on them. In the case of computerized controls, you need to consider a double vulnerability – not just cyber-warfare, but also to EMP effects too. If we encounter a major collapse of society, we can expect the dollar to disappear. We’ve discussed before the certainty that in Level 3 situations, current forms of money will become irrelevant and close to worthless. We’ve also indicated that gold will become less valuable in an extended period of massive social and economic disruption – this being quite the opposite of what many preppers anticipate. Everything we write below applies equally to Level 3 situations, but our comments start from looking at responses, in this article, to a less long-term Level 2 event. In Level 2 situations, there will be a strange duality surrounding regular money – ie, cold hard cash. As for any electronic forms of money, you have to assume they will be completely not accepted, due to the electronic banking and credit systems having failed. That also means ATM machines will not be working, so there’ll be essentially no way to get more cash. So, no credit cards, no debit cards, and almost certainly, no-one will accept checks, either. 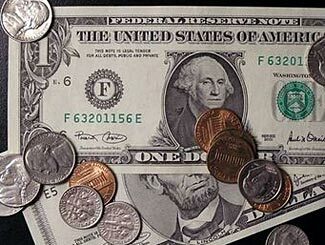 The only negotiable currency will be good old-fashioned greenbacks – which will accelerate the failure of the monetary system, because very few of us have much cash these days. Indeed, very few banks have much cash either, so even if banks were working, they wouldn’t be able to give cash to more than a few of the people holding deposits with them. This actually makes for a very interesting economic problem. Not only will supplies of real goods become very short and in great demand, but supplies of cash money will also be very limited, making money itself also in great demand. How will that be resolved? There’s one possible answer, which we’ll come to later in the article. But let’s first look at things from the perspective of the shortage of goods, ignoring a matching shortage of money. Then we’ll consider the monetary shortage separately. No matter whether in short supply or available in limitless qualities, money will be of little value during the Level 2 situation (due primarily to the shortage of things to buy with money). But in the expectation that money will become valuable again when Life As We Know It (LAWKI) returns, people who feel confident about surviving to the return of normalcy, and who have spare things to trade, will most likely trade the things of value they have for money that, although presently valueless, promises to return to some level of value at the end of the situation. This will probably mean that things become very much more expensive in terms of current currency values, for two reasons. Firstly, the simple and unavoidable dynamic of supply and demand. Our economy will massively transition from one in which there are too many things available for people to buy, but with the people having too little money to buy all the things they want, to instead a situation where there are too few items for sale at any price. Today, you know that you can go to the nearest gas station, and no matter how far you max out your credit cards, there’s no way you can buy every drop of gasoline they have in their underground tanks. And, even if you did (maybe you have an Amex Black/Centurion card), it wouldn’t really matter, because there might be another gas station on the other side of the road, and the station you just emptied would be resupplied with another 20,000 gallons later in the day. But in a Level 2 situation, with – at the very least – the oil refineries no longer operating, gasoline suddenly becomes very rare and therefore very valuable. Instead of all the money you have being insufficient to empty out a gas station’s tanks, now all the money you have might be insufficient to simply fill your car’s gas tank, once. The second reason why things will become more expensive is due to the uncertainty of the dollar returning to its normal value. A Level 2 situation has already shattered everyone’s confidence and faith in the certain ongoing constancy of LAWKI, and who’s not to say what might happen to the current currency when life returns to something resembling the former normalcy. Dollar bills have changed from universally unquestionably accepted guarantees of money, a certain representation of value, to instead, becoming something a bit more uncertain – they are now like betting slips at the race course prior to the race. Maybe your slip will be valuable, but maybe it will become worthless. Today, money has great intrinsic value, because we can readily convert it to whatever we wish. A dream vacation, a new car or house, anything at all, whether extravagant or essential, can quickly become ours if we have sufficient money. But, now looking into a Level 2+ scenario, a person for example, selling you the gas at some greatly inflated price – let’s just say, for want of a better number – $250 a gallon – doesn’t really need $250. What he most needs might be some food, or some more electricity to power his gas station, or something else tangible. In an economy where there is a shortage of tangible needed items, the items that are available go up in price – as you’ve just observed with the example of buying suddenly extremely expensive gas. You’d probably find the gas station owner would swap you a gallon of gas for a 5lb bag of rice or beans, and probably he’d prefer to take the rice or beans, because if he ‘only’ gets money, he then has the hassle of trying to find someone who will sell him food, and who knows if/when/where food will be available or what its price will be. Indeed, if he has 10,000 gallons of gas in an underground tank and no food on the table for dinner, he might swap many gallons of gas for just one pound of rice or beans. But if he has plenty of food and little remaining gas, then he’ll be asking for many sacks of rice for a single gallon of gas. Not only will money have no applicability to what he has and what he needs, the ‘exchange rate’ between, in this case, food and gas could vary enormously depending on the circumstances of the two people doing the transaction. Nonetheless, whether it be a day when food is more valuable than gas, or vice versa, there is almost certainly one thing that will always be of least value. Abstract money. Cash. So here’s the interesting thing. In preparing for this type of situation, if you have a spare $250, you can either keep it in cash, and guess/hope that it will buy you a gallon of gas when you most need it, or you can buy about 50 gallons of gas, containers to store it in, and some PRI-G to extend its storage life today – which for sure is much more gas than the $250 would buy you in a Level 2/3 situation. Besides which, wouldn’t you prefer to have the certainty of the gas, rather than to drive all around town, burning up 2 gallons of gas (at a replacement cost of $250/gallon) to end up being able to buy only 5 gallons somewhere. Alternatively, if local fire codes or your lease doesn’t allow you to have 50 gallons of gas in your garage, why not spend the $250 on long life shelf stable food staples. Our guess is you’ll be able to swap $250 worth of food (that you buy today) for much more gasoline (in a Level 2+ scenario) than you could buy with $250 cash. Best of all, split your funds and invest in a mix of both gas and rice. That way, when you find the man with lots of gas and little food, you can do a deal whereby you get a lot of gas for a little food in return, and when you find the man with lots of food but little gas, you can do another deal, again to your benefit. This means that you are becoming a trader. If there is an easy way for you to move around an area, balancing out individual surpluses and deficits, you could create an excellent new job for yourself. That’s not to say that such jobs would be free of competition, or sustainable longer term. The country general store will probably evolve to become a trading post, much as such stores were 100+ years ago. And sooner or later, some replacement form of currency will act as a more efficient intermediary than you traveling around with all your trading goods. But, short-term, you might find it a valuable way to earn a living. Whether you attempt to do this full-time or not, there is one thing that is clear. As we concluded in our earlier article about the different role of money in a crisis situation, cash will become of little value, because you can’t eat or drink cash, you can’t use it to keep warm, or in any other way, directly obtain comfort, safety, and sustenance from it. When prepping for the future, you should convert as much of your cash as you can to things either that you’ll need or which you can use as trade goods to swap with other people who will need what you have, but who might have something else in return that you need. As we mentioned above, there will be a shortage of actual cash in a Level 2/3 scenario. Few of us have more than a few hundreds dollars in cash lying around our homes. We don’t need more than that because we do most of our transactions electronically these days, with credit or debit cards, or sometimes still with checks. And if we do need more cash, we can quickly get some, 24/7, from a nearby ATM. So even if US currency were to be continued to be accepted, there just wouldn’t be enough of the stuff available to be used. Rather than this resulting in a revaluation of the dollar and what you can expect to buy for a dollar, we think it will instead result in an accelerated rejection of the dollar and a replacement by local currencies, based on some type of underlying local asset of value. As we touch on at the end of our article about the irrelevancy of gold as a future monetary instrument, in the past (as in dating back to 1704, and sporadically prior to that time too) there were good reasons for using gold as an international monetary standard on which countries could base their own currency and then trade from their currency to another country’s currency. But those valid reasons diminished during the 20th century, while at the same time, the weakness and flaw of gold as a monetary base remained as strong as ever. This is the fact that gold is not an object that inherently has any value, other than the artificial value we give to it. What is it that makes gold worth about $1500 an ounce, but copper worth only about $1.50? What is the valuable property that gold has one thousand times more of copper? There is no underlying logical reason for gold’s high value. Historically the reason that gold (and, slightly lesserly, silver) was used as a means of storing value was because gold didn’t rust or in any way diminish in quantity. Its long life and chemical inertia made it well suited as a semi-permanent means of representing abstract value. But in the very difficult times after a major collapse of society, people will not be interested in abstract anything. They will be necessarily interested only in things of real value – things that can keep them fed, watered, and sheltered. Gold does none of these things. We anticipate that any new currency will be based on being redeemable for an equivalent amount of food or of energy, and being as how food is merely a derivative abstracted form of energy, and being as how energy is one of the most basic ‘building blocks’ of everything else in the world, we think the unit of value will be energy based, perhaps with a fixed conversion to food, perhaps not. The internationally preferred unit these days is the Joule, and more likely, the Megajoule. But all the different units have fixed conversion rates between them (sort of like the fixed conversions between feet, inches, yards, chains, miles, meters, kilometers, etc) and so it doesn’t really matter which unit is the underlying basis which a future currency is measured by (and redeemable for). Prepare for a level 2 or 3 situation not by hoarding gold or cash, but by stockpiling food and energy. If you keep balanced amounts of each, you may be able to profit by trading either to people who need one type of item and who have a surplus of the other. Anticipate a future currency to evolve (in a Level 3 situation) that will be based on being redeemed for a specified amount of energy. Energy will become the new defining commodity on which the value of all other things will be measured. Unlike gold, energy has intrinsic value, making it well suited as a financial base.